Life's a Beach | Expat Life in Playa del Carmen : It's Official! 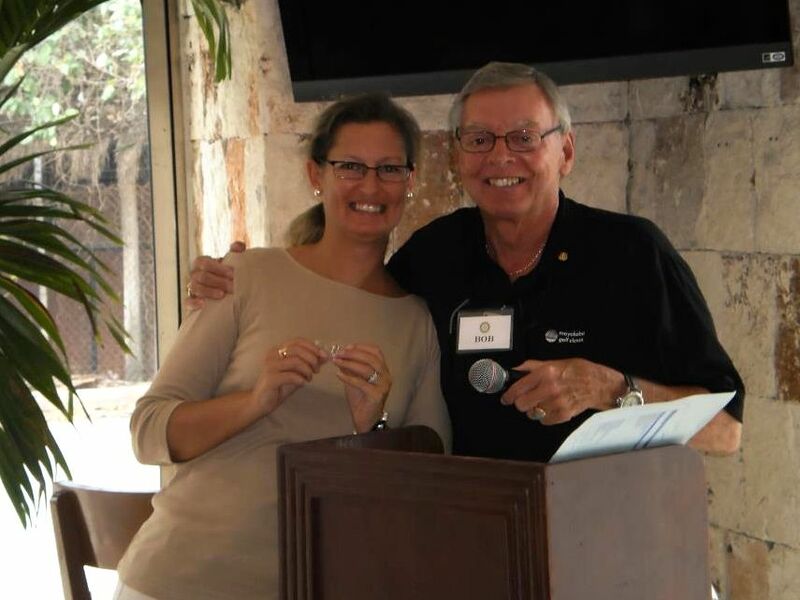 Last Tuesday, at the weekly meeting, I was inducted into the Rotary Club Playa del Carmen Seaside Chapter as an active member! President Bob Hyde presided over the short but official ceremony and presented me with my Rotary pin. I grew up in a family where volunteerism and community service was encouraged and expected, even of me as a child. My mother, an avid horticulturist, would take me once a month to the Child's Nursing Home where we would diligently tend the patients' gardens, pulling weeds, splitting ungainly perennials that had outgrown their space and adding in favorites selected from our own garden at home. My father was also an fantastic gardener but vegetables were more his forte. For his part, he converted several empty lots we owned in the poorer sections of the city into community gardens to be used by not only our tenants but their friends and families. I can remember long afternoons in the early spring shoveling and transporting thousands of pounds of composted manure from our property to the city gardens to enrich the soil. In the fall, we would return to till-under the dying plants into the ground putting the beds to rest for the long winter months in upstate New York. As an adult (notice I did not say grown-up) I have worked on and contributed to countless fundraisers and participated on numerous boards and committees. I am particularly proud to have participating in the founding committee for Taste of Playa which has become one of the Riviera Maya's most anticipated events. It was through my involvement with Taste of Playa that I was introduced to Rotary when we were invited as special guests to sit in on a meeting and present our proposal to them. That Chapter has been active in Playa for over 20 years but, unfortunately, the membership is not open to women so I am pleased to be welcomed into this newly chartered club and look forward to working with them on many exciting and beneficial community projects!